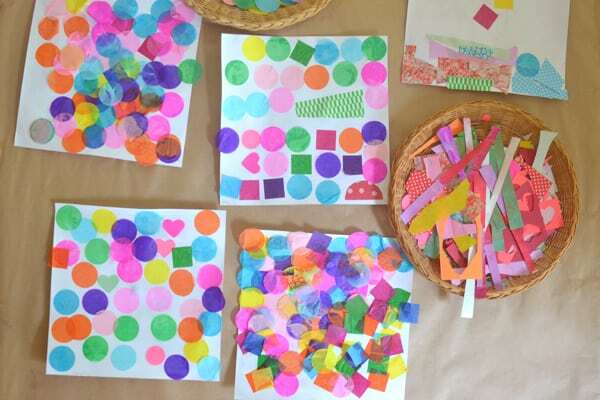 For the third idea in our ABCS and 123s letter and math activities series, please welcome Barbara from Art Bar who is sharing a beautiful way to combine art and math: making shape collages. I have always loved a good collage project. As a child I think it was the excitement of using glue that drew me in! But then as I moved on to art school, I really just loved the opportunity to work on composition and balance. 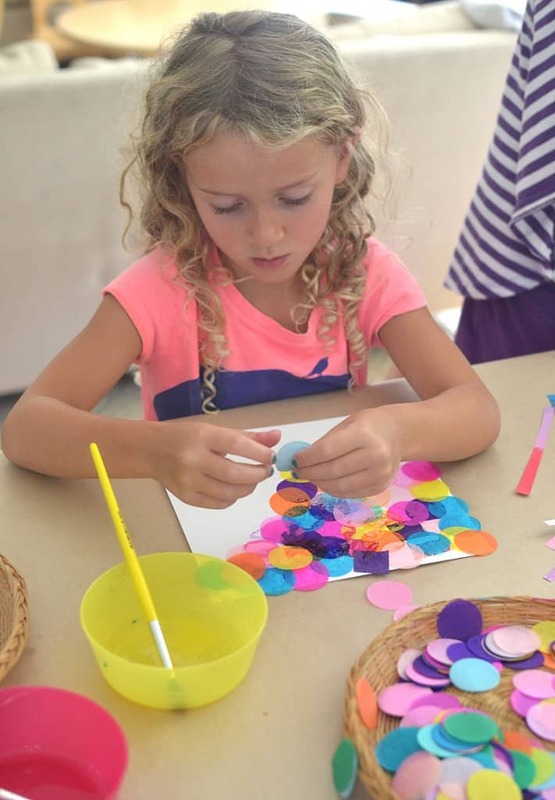 Depending on the time you have or the interest of your child, you can either set out some pre-cut shapes, or you can let you child cut their own shapes. I presented the children in my art class with both options. I put the glue in bowls and placed an inexpensive brush in each bowl (I save the brushes that come in paint sets for working with glue). I find that when the glue is in a bowl with a brush then the children will be less likely to squeeze too much glue on their paper. After setting the table with the materials and giving each child a piece of white paper, I just stand aside and let them work. As a teacher I am much like I would be as a parent – I am there to answer questions or lend a hand if asked, but not be involved in the child’s creative process. It’s magical to watch them work and create art from their heart. I always make sure to have a damp cloth handy for sticky fingers. Some children really don’t like that feeling, and of course there are some who really do! To encourage the ones who don’t like to get messy, I make clean-up easy and close-by. Each child’s artwork is unique and reflects their personality. I love how one child overlapped her tissue and created new colors. Another child was keen to keep everything very orderly. And another barely used any pre-cut shapes and instead, used the scissors like Matisse and cut his own shapes. 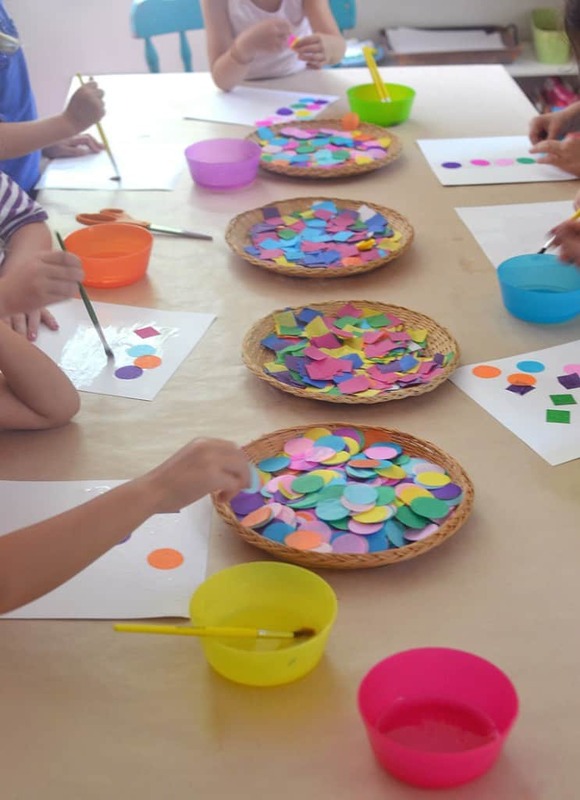 By making their own choices about color and composition, they are practicing their critical thinking skills and learning to take risks in a non-judgmental setting. They are exploring basic shapes and abstract shapes while creatively putting together an image. This gives them an opportunity to associate shapes with real life objects. When using the tissue paper, they are learning about transparency, and how colors can mix and overlap to make new colors. 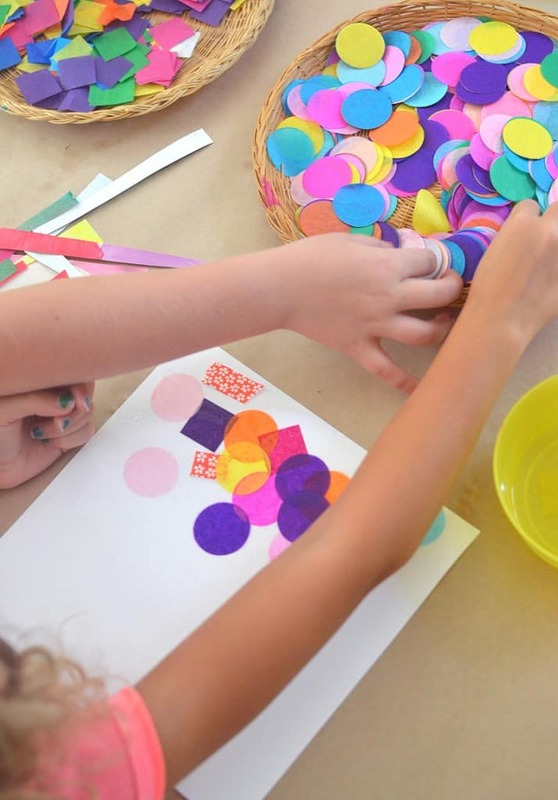 If you have more than one child, or if your child has a friend or two over, they can make a collaborative collage on a bigger piece of paper or a big piece of cardboard. Introduce other items for your child to collage, such as fabric scraps, feathers, pom-poms, buttons, leaves, or any found material. 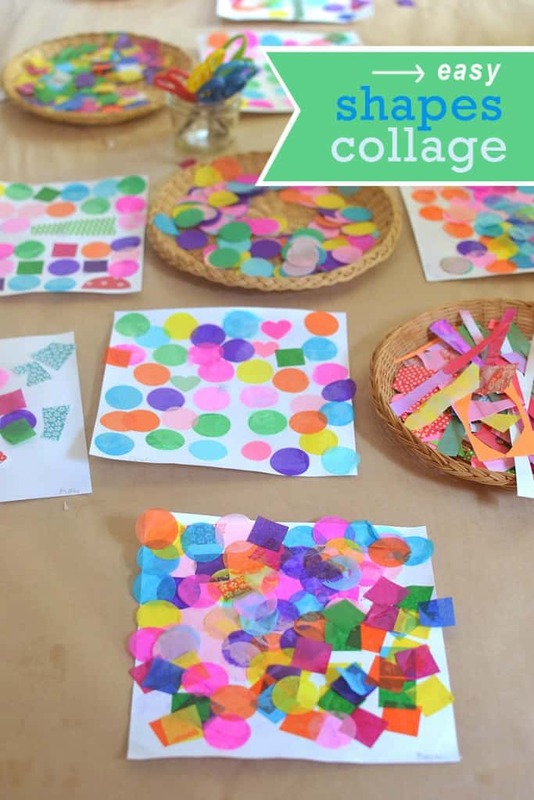 Cut out the shape of an animal or perhaps the shape of a house for your child to collage. 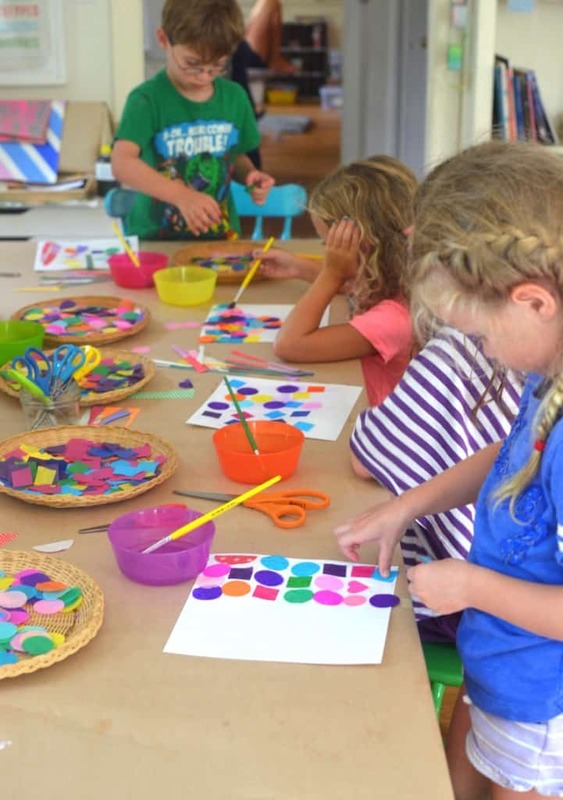 Creativity is Messy: Let them Explore! I hope you enjoyed this post! Please come visit me at Art Bar Blog, a happy place full of creative ideas for kids. And follow me on Facebook where I share lots of art projects for kids, DIYs, inspirational quotes, helpful articles, and much more from all over the world! Bar is a graphic designer, art teacher, and mom of three living in Connecticut. 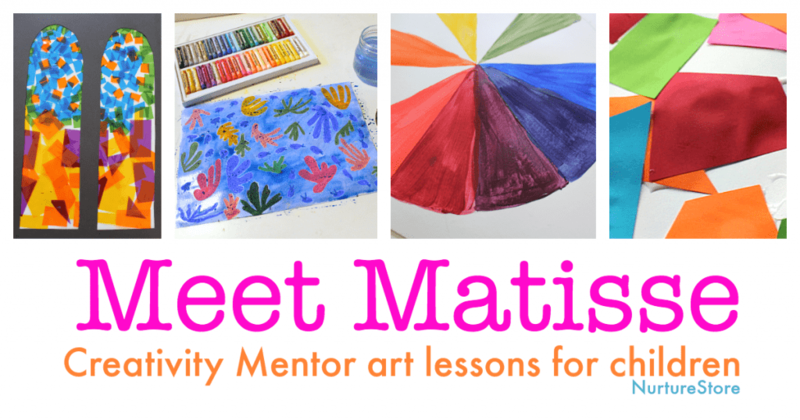 She loves to make stuff with her kids and write about it on Art Bar Blog. i love this this idea! how did you make such perfect circles? Hi Jane. 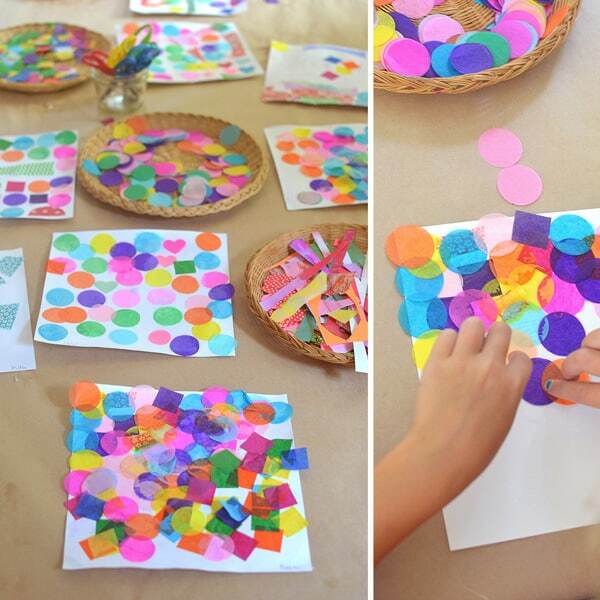 You can buy packs of tissue paper shapes, or you could use a circle punch.